Different cultures have different ways of dealing with tragedy. Most will encourage looking to your faith to find a higher meaning than what we mere mortals can imagine. Some encourage forgiveness to those who have wronged you and, some go even further to encourage forgive and forget. How do you forgive and forget someone who has taken the lives of your loved ones, accident or not? Everyman Theatre’s latest production, Everything is Wonderful by Chelsea Marcantel, Directed by Noah Himmelstein, tries to answer this tough question as we see tragedy and loss through from the viewpoints of a family in crisis, a young man full of guilt, and a man who believes he’s near perfect because he’s practically been told so his whole life. In a nutshell, Everything is Wonderful concerns itself with an Amish family who lost two sons when a drunk driver smashed into their buggy, a daughter who doesn’t seem cut out for the Amish life, and a culture that forgives and forgets, but only on the surface. Ultimately, I gathered this piece is about following your own conscience to find forgiveness, regardless of what those around you may think or do. Marcantel’s text is easy to follow and presents these complex problems in simple terms which is why I believe this script is so successful. The dialogue is natural and it flows as conversation between folks should. 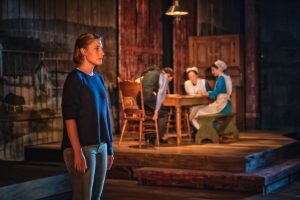 She has a good comprehension of the subject matter and creates a world into which we can step and be a part of the story making for an enjoyable evening of theatre. The story that Chelsea Marcantel weaves is flawless and Noah Himmelstein has given us simple, yet engaging presentation with the help Daniel Ettinger’s exquisite Set Design. Himmelstein and Ettinger use the space well and the action moves at a great pace working in tandem with a precise and effective Lighting Design by Cory Pattak that puts us in each appropriate location without a bunch of bells and whistles. Sometimes less is more and it is absolutely true for this production and both Ettinger and Pattak knock it out of the ballpark. Himmelstein has a tight grasp on this material and his staging is immaculate. He keeps the audience interested in the story by using practically the entire theatre with the correct entrance and exit points while keeping a good flow without a lot of clunky scene changes, which is what I’ve come to love about theatre these days… not a lot of, if any, blackouts, unless they are absolutely appropriate. It’s the details that make this production so successful, as well. 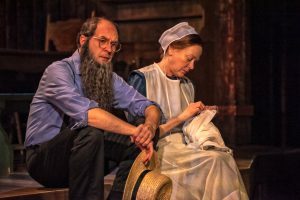 For instance, the slight accent of the Amish characters is so authentic, both Himmelstein and the performers are to be applauded for their efforts. Overall, Himmelstein hit the nail on the head with this and should be commended for his work. The cast is simply amazing, and I mean every single one of them. Resident Company member Bruce Randolph Nelson portrays Jacob, the patriarch of the Amish family and, he completely embodies this character taking on all of his trials and troubles. He seems comfortable in this role and his performance is strong and confident making him a standout in this piece in both his authenticity with the role and his gentle handling of the character. Along with Nelson, another Resident Company member, Deborah Hazlett shines as Esther, the matriarch, and the mixed, bottled up emotions just spill out of her throughout this production. She has a deep understanding of this character and her portrayal of her, as a grieving, staunch mother is impeccable. 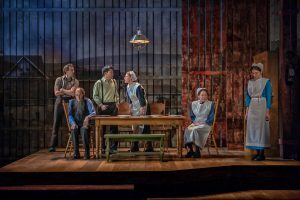 Both Nelson and Hazlett, through their performances, bring home the message of forgiveness in their portrayals of these two characters, and not just surface forgiveness, but true and deep forgiveness, even in the hardest of situations. Two highlights in this production are Alex Spieth, who tackles the role of Miri, a former Amish girl and estranged daughter to Jacob and Esther, and Tony Nam, who takes on the role of Eric, the driver of the car that hit the buggy, taking the lives of Jacob and Esther’s sons. Both Spieth and Nam are able actors who have a good comprehension of their characters and portray them naturally in both delivery of the dialogue and in manner. 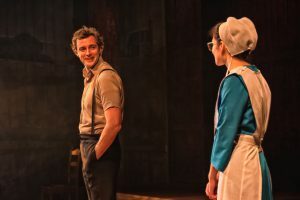 Eric wants to get in and Miri has gotten out, and is fine with her choices and the conflict between these two characters is beautifully presented by Speith and Nam and both give strong, confident, and poignant performances. Rounding out the small ensemble, the adorable Hannah Kelly takes on the role of Ruth, the good daughter, who is content with her Amish life and wants to be a good person and is a good person, and the dashing Steve Polites, tackles the role of Abram, the tall, handsome, boy next door who seems to be the apple of the community’s eye, but has a secret dark side. Kelly undoubtedly knows her character inside and out and her portrayal is authentic, and, because of her portrayal, you can’t help but like this character from the get. She invokes a gentleness that’s believable and gives a tender performance that is required of this young girl. Polites has a strong command of the stage (it doesn’t hurt that he’s a little over 6’ in height, or so it seems) and his voice is smooth and booming, which works very nicely with this character. He takes this character and makes it his own, walking the line between the perfect son and the devil among us, making for an intriguing and exciting performance. 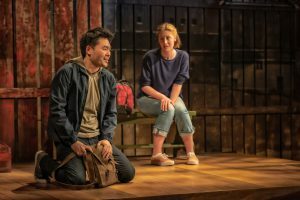 Final thought… Everything is Wonderful at Everyman Theatre is a poignant, thoughtful piece that makes us look into our own selves and question what we would do in a certain situation. From Set Design to Costumes Design to performance, this production is not one you want to miss this season. There’s not one performer who can’t hold his or her own and the material is through provoking with dashes of humor that take the audience on a roller coaster of all the feels. It enlightens us about a culture that is seemingly veiled in plain sight and puts us all on a level playing field. If you don’t have your tickets already, get them now. I reiterate… you do not want to miss this one. This is what I thought of Everyman Theatre’s Everything is Wonderful… What did you think? Please feel free to leave a comment! 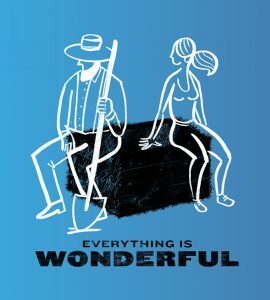 Everything is Wonderful will play through February 24 at Everyman Theatre, 315 W Fayette Street, Baltimore, MD. For tickets, call the box office at 410-752-2208 or you can purchase them online. Like Backstage Baltimore on Facebook and Follow us on Twitter and Instagram! This entry was posted in Reviews and tagged Alex Spieth, Baltimore Theatre, Bruce Randolph Nelson, Chelsea Marcantel, Cory Pattak, Daniel Ettinger, Deborah Hazlett, Everyman Theatre, Everything is Wonderful, Hannah Kelly, Noah Himmelstein, Steve Polites, Tony Nam by Jason. Bookmark the permalink.